Ten years ago the opportunity presented itself in a little advertisement with the heading: “cake decorating classes for beginners”. I have been baking and decorating ever since, perfecting my skills with every cake. I pay a lot of attention to the quality and detail of my work and the clients are very happy and satisfied. In 2012 I graduated from the Culinary College with a Diploma in Patisserie. Even with so many years of experience in decorating, I am constantly learning new techniques. This year I have added a pull sugar technique to my list of expertise. Most of my clients are parents who order cakes for their children, but all Brides are welcome too. 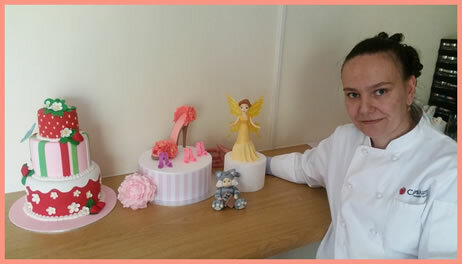 I have made so many different character cakes, that I have to choose carefully which pictures I want to show on the website. Now I would like to work more often with wedding cakes. I also offer a wide range of edible gems and exclusive figurines. Desserts are all a different story. All of them are of very high quality, made with organic ingredients and the best Swiss chocolate. All of them require refrigeration. From spring of 2015 my work studio will open for classes; from the basics of figurine making to advanced individual classes.